Compaired to the Looks of the Week: Pants Edition post last week the collection of looks below is a somewhat more versatile – With a killer jumpsuit, chic mini and maxi skirts, stylish pants in various fits and silhouettes, and fabulous outerwear from fashion bloggers and models around the world. This is without a doubt the best look that I came across this past week. It’s striking, flattering, fashion-forward, and just plain fabulous – From the killer red jumpsuit to the silver spiked braid to the oversized clear clutch. Wow! I love the combination of the white pleated maxi skirt & basic white tee paired with the bright, patterned jacket by Milly. It’s fun, unique look that makes me miss Summer! What I love most about this look is the texture of the patent oxblood skirt combined with the matte, loose-fitted blouse. Oh, and those shoes. J’adore ankle straps! This is such a feisty, rock n’ roll look – I LOVE her studded jacket and those buckle-adorned boots are totally killer! This look is such a fun combination of colors, fabrics, and textures – It’s really eye-catching and fashiony, but still looks relaxed and comfortable. There’s pretty much nothing more classic than a trench coat but leave it to Saucy Glossie to choose a leather sleeved version and pair it with a fun, eye-catching leopard print scarf. Great combination! Black & brown can be a hard color combination to put together but when it’s done right it can be pretty striking. This silhouette paired with the 70’s inspired felt hat is a great look – Très français! Which of these looks is your favorite? Are there any new trends or fun new styles you’re especially excited to try out this Fall? Welcome to another Looks of the Week post. I have to confess that I really love this series, not only does it give me an excuse a chance to scan blog after blog looking for great outfits, it provides me with much-needed inspiration for my own daily looks each week. From great uses of jewelry to inspired styling to new handbags to interesting new ways to pair things… These looks have it all! A white dress (LWD) is a must this Spring and Kayture blogger Kristina shows us how the pros do it here. Her Topshop shirt dress is simple but the look is anything but with the dramatic silver choker, bright pink clutch, and adorable polka dot Zara platforms. I really like the muted plaid of this double-breasted coat as well as her adorable low ankle boots. I love boots but since I walk everywhere so flat or low-heeled boots are great options, and these are a lovely choice! I'm not going to lie, these shoes kind of freak me out. What drew me to this picture was actually the mixing of the black & white stripy print with polka dots and a splash of pink. Great styling! Despite that fact that she's wearing cheetah print pants, this look still manages to be low-key. Low-key and fabulous to be sure, but low-key nonetheless. And that's what I like about it. A standout printed piece paired with a basic button down and sandals. The accessories are top-notch as well, LOVE the stacked bracelets. A great neutral look that isn't boring can be hard to put together and what I especially like about this look is the layering and the flashy gold shoes. No one does hippie-chic quite like Kate Moss. This gold & black embroidered tunic and gorgeous gold over-the-shoulder bag are right on trend. Call it boho, hippie, or gypsy, the truth is that she's just plain stylish. Brooklyn Decker looked fresh & chic in Theyskens Theory & Isabel Marant. Pairing the fun, ornate jacket with a basic but stylish dress was brilliant, and I love love love her shoe choice. While this dress is cute and a great color for her, what this look really shows you is the power of tailoring. This dress fits her perfectly and that really makes the look! These bold stripes are right on trend for Spring. I love the unexpected color combination and the subtle sheen of the fabric. And that Stella McCartney bag is TO DIE FOR. 0% Country, 100% fabulous - Taylor Swift looked STUNNING on the red carpet at the 2012 Academy Of Country Music Awards this weekend. From tween to award show goddess - well done Tay! The maxi season is upon us! Lily Collins looks adorable in this brightly colored Peter Som maxi, it's a fun, standout look. Source Has anyone seen Mirror Mirror yet? It’s on my To Do List for this weekend… My love for fairytale-based movies is second only to my love for comic book movies. The great events and parties during Milan Fashion Week included the AMFAR gala, the opening of Gucci Museo and dinners celebrating many of the shows. Model Nadine Ponce captured after the Dolce show by Craig at Models Off Duty. 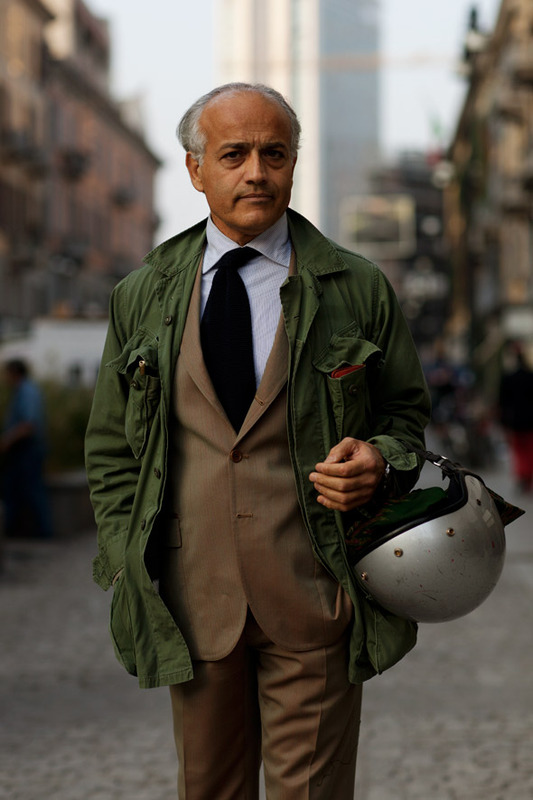 I am an absolute sucker for the older Italian gentlemen that The Sartorialist shows on his site, so here’s one final Milanese look to tide you over until I’m back with the Parisian shows!